Kasihma Shrine (鹿島神宮, kashimajingu) is the one of the oldest Japanese shrine located in Kashima, Ibaraki. The shrine appears in Japanese myth and it said Kasihma Shrine was built in B.C.E. 660 by the first Japanese Emperor Jinmu. Kashima Shrine enshrines Takemikazuchi (武甕槌神) who is the god of warrior. Kashima Shrine and Katori Shrine, which enshrines Futsunushi no kami (経津主神) who is also the god of warrior, are the sacred place for all martial arts and worriors in Japan. Therefore. many Dojo (Japanese martial arts school) have their spiritual scrolls for their success and eternal prosperity. Because the shrine is the sacred place for all samurai and warrior, many samurai and shogun worshiped this shrine. Bokuden Tsukahara (塚原卜伝), “Sensei, the highest rank of sword master,” was born in Kashima and he found out the truth of sword at this shrine. After his death, many samurai and sword master, even today, visit Kashima Shrine for their success of their sword. There is parking. 2nd Sunday of June, the shrine has budo (martial arts) festival. The sacred items of Kashima Shrine are powerful for all martial artists. Takemikazuchioomikoto ? God of warrior. In the time of gods, the mother god, Amaterasuoomikami, and other gods established Japan and in order to rule Japan, she decided to conquer the disordered lands at first. However, two of their warriors they sent had failed and never came back. There for the mother god decided to send Takemikazuchi oomikami, to conquer the those disordered land. The march of Takemikazuchi started at Isana Beach at Izumo, and when he finished at Kashima, which is the far east of Japan, He built two shrines, Kashima Shrine and Katori Shrine, to protects their home land. Establishment of Kashima Shrine was the same age when Japanese first emperor was enthrone in BCE 660. The god of Kashima gave him the sacred sword, futsuno mitama no tsurugi, to help his eastern war. At the time of 10th emperor Sujin, he faced to many disasters and his people were suffering. Someday, the emperor got the divine message of god to enshrine his messenger, the deer, the he will quiet this disaster. So, the emperor brought many gift to the god, and brought back the sacred deer at Nara, which was the capital at this time. At the Heian Period, from the end of 8th century to the end of 12th century, Kashima Shrine is one of three shrines (Ise Jingu, Katori Jingu and Kashima Jingu) ranked Jingu, the highest rank of Japanese shrine. Haiden and Honden, the main shrine, was built in 1615 by second Tokugawa Shogun, Hidetada. Kariden is the used for temporary placement of the god, when the main shrine was in reconstruction. This is also built in 1615. Okunoin was built in 1605 by the Shogun Ieyasu Tokugawa. 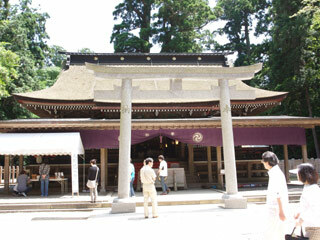 It was originally the main shrine, but when Hidetata built new shrine, it was moved to the deep side of Kashima Shrine. Mitarashi ike (body wash pond) is the pond with sacred spring which was used for washing body before people worship at Kashima Shrine. Legend said no matter what height of people enter this pond, the depth of water never changed. Kaname ishi (Important stone) is the stone which hold the head of earth fish. People believe this earth fish course of earthquake. Because of this stone, there is no big earthquake in Kashima. Stone looks small but it is so huge under the ground. No body ever succeeded to dig this stone out. The Deer is the messenger of Kashima to connect Izumo which is the land of Japanese Gods live. Current deer are given from Nara when all deer died, but original deer of Nara are given from Kashima Shrine. Futsuno mitama no Tsurugi (布都御魂剣) is the sword made in the beginning of Heian period, and one of the national tresure of Japan. It is one of the oldest sword in Japan. It has 2.71m length.